The USB rechargeable Metro 400 provides the perfect balance of affordability, performance, and safety all in a versatile package that's perfect for road cyclists and commuters. 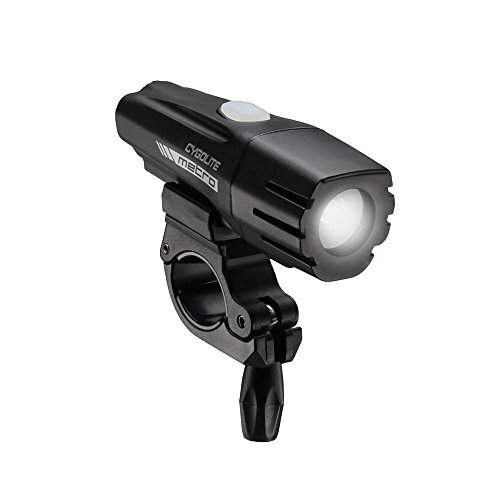 This cyclist's choice light fires up 400 lumens at night, optimized with cycling-tuned optics to maximize your line of sight with exceptional brightness and clarity. With 6 powerful lighting modes (3 steady, 2 flashing, 1 walking), and up to 30 hours of illumination on a single charge, the Metro 400 has you covered night and day. In addition to the steady brightness modes, patent pending SteadyPulse mode alerts motorists with attention grabbing flashes while an overlapping steady beam constantly lights your way at night. For use as daytime running lights, eye catching DayLightning mode emits a boosted 500 lumens of lightning-like flashes to make you stand out in broad daylight. The sturdy quick release handlebar mount keeps the light securely fastened in rough terrain while allowing quick and easy detachment as needed for use as a handy flashlight or for storage while not in use. Buy with confidence in Cygolite, as every light is designed, engineered, and assembled in the USA to rigorous quality and testing protocols - outshining and outlasting cheap imitations. For customer service, email and phone support with live customer personnel offers you fast and easy assistance from right here in the USA. If you have any questions about this product by Cygolite, contact us by completing and submitting the form below. If you are looking for a specif part number, please include it with your message.